Happy Sales 5.25-Inch Dia Mesh infuser. This all-purpose infuser to make tea and add herbs & spices for cooking The Infuser is a must-have accessory in your kitchen. 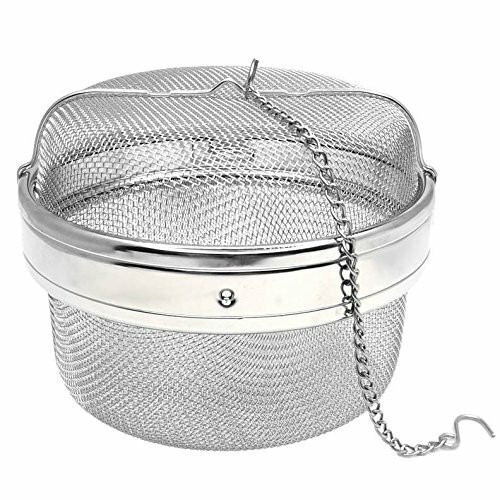 Durable, the stainless steel infuser is capable of brewing teas of all kinds. It can also use as an herb and spice infuser, perfect for adding extra flavor to various foods and drink ranging from soup, broth, apple cider and wine. Equipped with a convenient hook and chain, manage brewing time to bring out the optimum flavor! EASY TO CLEAN Twist off the top and rinse - couldn't be simpler. Our infuser is designed to be easy to clean with just running water. DIshwasher safe but just as easy to simply rinse and let air dry. If you have any questions about this product by Happy Sales, contact us by completing and submitting the form below. If you are looking for a specif part number, please include it with your message.